Labor group the Trade Union Congress of the Philippines-Nagkaisa welcomes the positive and exponential presence of Miss Universe Pia Alonzo Wurtzbach into the campaign against Human Immunodeficiency Virus (HIV) and Acquired Immune Deficiency Syndrome (AIDS) particularly in the Philippines where incidence is growing at fast and furious pace. “Pia’s leverage into the campaign against HIV and AIDS in the country is a morale booster to HIV/AIDS advocates and activists. She comes into the issue at a time when the campaign is at all-time low because of appalling high growth of incidence and everyone seemed not to care anymore. 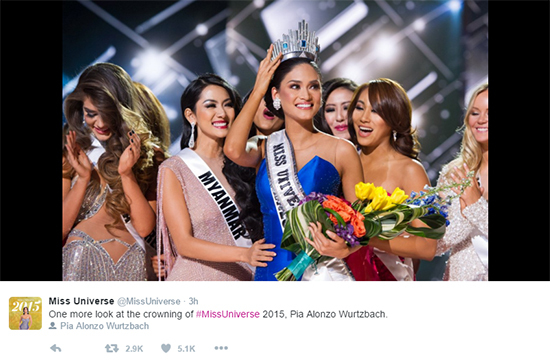 Ms. Wurtzbach’s energy and vitality into the advocacy will radically change the equation,” said TUCP spokesperson Alan Tanjusay. The number of cases reported is increasing in recent years with a case per day in 2006 to 21 cases a day in March 2015, Tanjusay said. Most of those infected are in the median age of 27 and the youngest is 14 years old with infection grew more than ten-fold from 44 in 2006 to 995 in 2015 records from National Epidemiology Center of the Department of Health (DOH) show. Wurtzbach, in her winning response to question on why should she be a Miss Universe, said she will use her voice to influence the youth and raise awareness to certain causes like HIV. This entry was posted in Advocacy, Press release and tagged Miss Universe 2015, Miss Universe 2015 winner, Pia Wurtzbach, Pia Wurtzbach supports HIV/AIDS awareness campaign on December 21, 2015 by Yami.